Step away from the dishwasher! Instead, use this DIY technique to clean your sullied wooden cutting boards and achieve safe and spotless results. Your hardworking cutting board constantly plays host to meats, veggies, and herbs. Over time, however, such unsavory characters as bacteria, stains, and odors are bound to make an appearance. Regularly sanitizing your cutting board is key to preventing cross-contamination and food-borne illness. The proper method of disinfection depends on the board’s material. Plastic cutting boards are easy to clean in the dishwasher, but the soft surface tends to develop bacteria-trapping knife scratches over time. 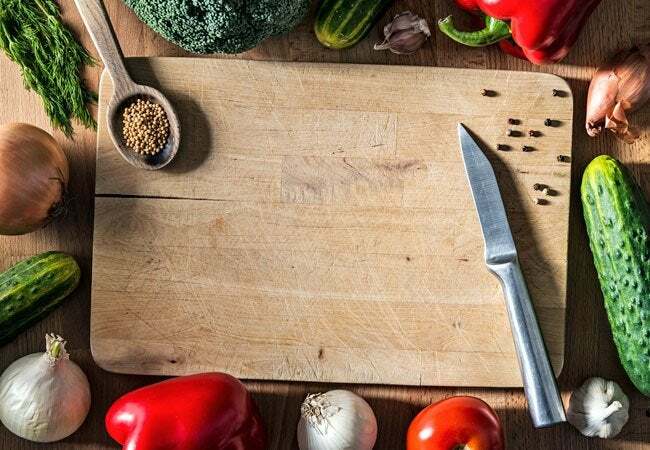 Durable wooden cutting boards don’t scratch as easily, which cuts down on the number of germs that collect, but the boards can’t withstand a run through the dishwasher. The porous wood surface will warp and crack from the machine’s high temperatures. So, how do you sanitize a wooden surface? Here’s how to clean a wooden cutting board with materials you already have on hand. Use a plastic spatula to scrape off any chunks of food lingering on the cutting board, and discard them in the trash. If you used the board to cut raw meat, move clean dishes away from the sink to prevent contaminating them with salmonella, E. coli, and other microscopic culprits that may be on the wooden cutting board. Once the sink is clear, rinse the top, bottom, and sides of the wooden cutting board in tap water for several seconds before air-drying it completely. Avoid submerging the board in a sink basin full of water. The dingy liquid can not only permeate and warp the wood, but also recirculate bacteria back onto the surface. Spritz enough white vinegar onto the board to coat all exposed surfaces. Allow the vinegar to sit for five minutes, then wipe it off with a damp cloth. While white vinegar suffices as a regular cleaning treatment for your wooden cutting board, it’s wise to follow up with a more potent antibacterial method if the board frequently touches raw fish, poultry, or other meat. Flood the top of the board with hydrogen peroxide. Then, using a clean sponge, evenly distribute the liquid over the top, bottom, and sides. Let the hydrogen peroxide sit for 5 to 10 minutes before rinsing the board under water and patting dry with a clean sponge. 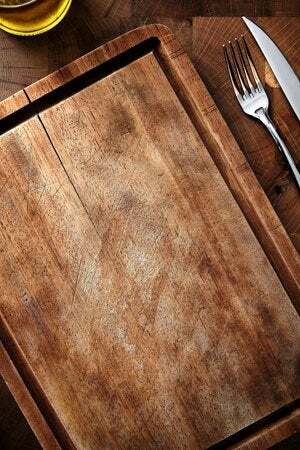 To rid your wooden cutting board of stubborn stains from poultry or pungent odors from food like fish, garlic, and onions, generously sprinkle a few tablespoons of coarse sea salt or baking soda over all surfaces of the board. Then gradually scrub the grains with a halved lemon, juicing the fruit as you go in order to mix the salt or baking soda with citric acid. Let the mixture settle into the board for at least 10 minutes (or overnight if your board is particularly musty) before wiping away the residue with a damp cloth and air-drying. Conditioning your wooden cutting board will help it last longer. Start by dipping the tip of a soft cloth into a half cup of a food-safe mineral oil, preferably walnut or almond. (Avoid using vegetable or olive oil, which can break down, turn rancid, and leave an unpleasant odor on your cutting board.) Working in the direction of the wood grain, use the cloth to buff the oil into the top, bottom, and sides of the board. Let the oil harden for at least six hours before storing the board in a location that receives plenty of air. This will prevent the growth of bacteria that thrive in moisture-rich environments. Performed on a quarterly basis, this conditioning ritual will prevent fractures from forming in the wood and preserve the beauty and durability of your wooden cutting board.